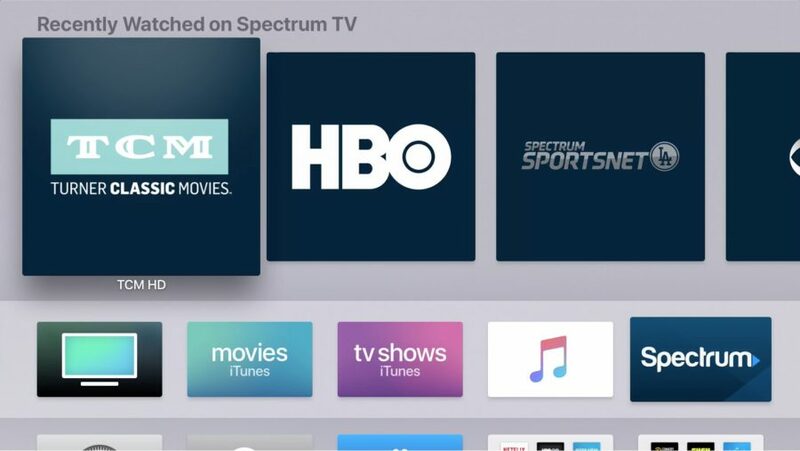 Announced at Apple’s Worldwide Developers Conference in June 2018 and originally slated to appear later that year, the Spectrum TV app for Apple TV from Spectrum finally arrived in the Apple TV App Store in early January 2019. 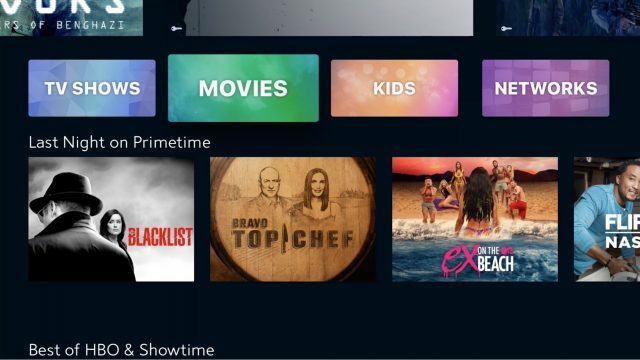 Spectrum’s new app, available for the fourth-generation Apple TV and Apple TV 4K, implements the new Zero Sign-On feature that Apple made available to developers in tvOS 12, and it makes a bid to replace the traditional cable box for Spectrum cable and Internet subscribers. As a Spectrum subscriber, I have been waiting for this app from the moment I first heard about it, and now, at long last, I have had the opportunity to determine whether this app can serve as a credible substitute for the Motorola DVR cable box that I rent from Spectrum for $11.75 every month. To find out, I decided to spend a week using the Spectrum TV app exclusively, rather than the cable box I usually use when I watch TV. Very little need be said about this: open the App Store app on your Apple TV, search for Spectrum, download the app, and launch it. That’s it. Well, not quite. That’s it if you previously specified Spectrum as your TV provider in Settings > Accounts > TV Provider, or if you purchased your Apple TV from Spectrum, in which case the Apple TV should already be configured to use Spectrum (Spectrum will sell you a pre-configured Apple TV at list price, whether you pay for it all at once or in monthly payments). In either case, when your Apple TV connects to the Internet via Spectrum, the Spectrum TV app immediately detects the Spectrum connection and signs you into your Spectrum cable account—no need to authenticate with a verification code or a username and password—that’s what Apple means by “Zero Sign-On.” It worked perfectly in my case: I had specified that Spectrum was my TV provider months ago, so when I launched the Spectrum TV app it “knew” who I was, and it populated its viewing guide with all the cable channels, both basic and premium, to which I subscribe. There’s one more step, though. 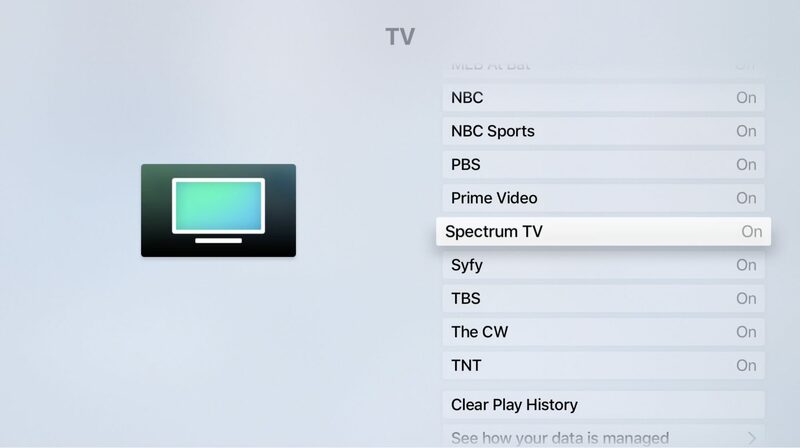 The first time you open the app, it asks if you want to connect the Spectrum TV with the Apple TV’s built-in TV app. You probably want to do this because that allows Spectrum’s on-demand offerings to appear in the TV app’s Up Next, Watch Now, and other lists, alongside movies and TV shows from other providers. You can connect later if you like: Settings > Apps > TV > Connect to TV gives you the capability to connect or disconnect the Spectrum TV app from the TV app. Connecting the Spectrum TV app with Apple’s TV app. The Spectrum TV app, by default, opens to Live TV streaming when launched, though you have other choices from the menu that appears at the top of the screen. That menu soon fades away, but you can bring it back by pressing Menu on the Apple TV remote. My Library: This choice displays recently watched channels and on-demand items you have added to your watchlist. Browse: Choose this to see all of Spectrum’s on-demand offerings. These offerings are divided into categories such as TV Shows, Movies, Kids, and Networks. The Spectrum TV app’s Browse screen offers access to on-demand programming. Search: You can search for titles, actors, channels, and more from this screen. If you have enabled Siri on your Apple TV (Settings > General > Siri), you can dictate your search terms. Select any of the hits returned from a search to begin viewing. Settings: This choice lets you set up parental controls, manage your favorite channels (a must if you have a subscription that includes hundreds of channels), and clear your Recently Watched list. The Live TV screen is where all your subscribed cable channels live. The screen displays a channel guide similar to the one from your cable box; to see it, swipe up twice on the Apple TV remote. You can then swipe up or down to move among the channels, and you can click a show’s entry in the guide to view it. Press the remote’s Menu button to return to the live stream without selecting anything. The Spectrum TV app’s channel guide can require a lot of scrolling. 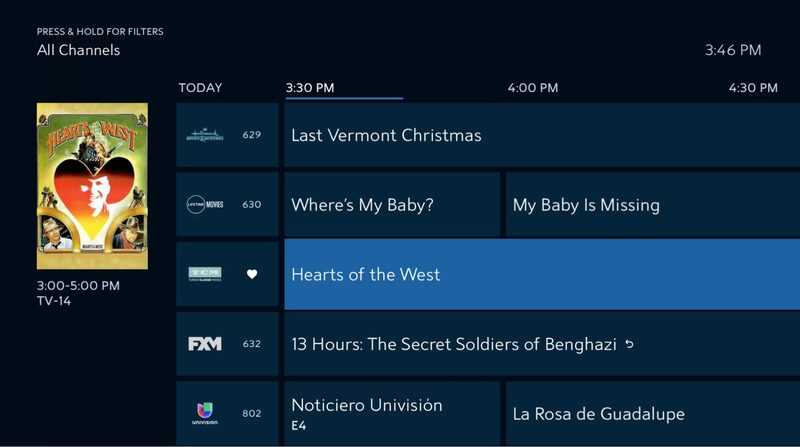 The channel guide is currently the weakest part of the app, as there is no easy way to navigate from, say, channel 2 to channel 500 other than by swipe, swipe, swiping on the remote’s touchpad. You can make this navigation marginally easier by clicking a channel’s name in the list to add it to your favorites and then filtering the list (press and hold to see a menu of filtering choices; Favorites is one of the choices)—but only after you have first navigated the whole guide to find channels to add to your Favorites list. Happily, Spectrum promises to add a “Turbo Scroll” feature to the guide so you can swipe along the right side of the remote’s touchpad to move quickly through the channel list: Turbo Scroll is already available in the Browse screen’s lists. More useful is the Recently Watched list, which retains the last dozen or so channels and on-demand offerings that you have watched most recently. A single swipe up on the remote brings up this list. After you have used the Spectrum TV app for a while, this list becomes an easily accessible super-favorites list as well as a substitute for the Back button available on most cable box remotes that, when pressed, jumps back to the most recently watched channel. Use the Recently Watched list to choose channels and programs you have watched most recently. Watching live TV with the Spectrum TV app instead of with my DVR-enabled cable box had its drawbacks. I couldn’t pause and resume a live stream with the app, nor could I schedule recording of any program for later viewing. The lack of recording, however, is partially overcome by the wealth of on-demand offerings: many live programs offered by the major broadcast networks are available from Spectrum for on-demand viewing for several days after they air. Unlike with a live stream, you can pause, rewind, and fast forward through most on-demand programs with the Apple TV remote. In addition to the main Spectrum TV menu that you invoke with the Apple TV remote’s Menu button, you see a programming information menu when you swipe down while watching live TV. With this menu you can find out program information, turn subtitles on or off, and adjust the audio. Use the programming information menu to see additional details and choose various playing options. As I tested the Spectrum TV app I found that the live stream was sensitive to network congestion. For example, the live streams of NFL playoff games featuring local teams were marred by occasional freezes, loss of sound, and heavy pixelation. Similar problems did not affect the live broadcasts I watched through my cable box nor, interestingly, when I watched with the Spectrum app on my iPad, which also provides live TV streaming. My iPad, of course, uses the same Wi-Fi network as the Apple TV, so Spectrum has some work to do to improve performance on its Apple TV app. As any good Apple TV app should, Spectrum TV works with Siri on the Apple TV remote. When you watch on-demand programs that allow pausing and fast forward/rewind, you can control those functions with Siri commands. Spectrum says that you can also use Siri to tune to any channel by saying, “Watch channel name,” but in my experience that often doesn’t work: You have to say the name of the channel exactly as the Spectrum TV app understands it—and the app does not help you find out what those channel names are. For example, I can tune to Turner Classic Movies by saying “Watch TCM” but I have yet to convince Siri to tune to the local channel 13, which variously goes by the names “My TV,” “My 13,” and “KCOP HD” in the recently watched list and channel guide: instead Siri either tells me it can’t find anything or it comes up with on-demand offerings that include the number 13 in their titles. The Spectrum TV app also works with Apple’s HomePod smart speaker. If you have a HomePod on your network, you can route the app’s audio to HomePod using the audio controls mentioned above. I have a HomePod stereo pair flanking my TV, so with a couple of swipes and a click I can bypass my TV’s built-in speakers (not terrible, but not great) and play the audio through the paired HomePods instead, which sound very fine. In addition, I can pause, play, and rewind on-demand programs via Siri commands through the HomePod, and also control the volume. Being able to say “Hey Siri, mute” is extremely welcome when I want to turn off the sound without my hunting around for the remote. Siri on the HomePod is less intelligent about Spectrum TV program information, though. For example, while I was watching The Longest Day (1962) on TCM, I asked the HomePod what was playing, and Siri responded, “The Longest Day by Laurie Anderson.” (Note that the last music I had played on my Apple TV was a piece by Laurie Anderson.) Huh. One nice feature is support for tvOS’s Top Shelf feature: if you place the Spectrum TV app on the first row of apps on your Apple TV, your recently watched list appears on the Apple TV’s home screen whenever you select the app. Then just swipe up, click an item in the list, and Spectrum TV launches immediately, tuned to the channel or program you selected. In my week of testing, the Spectrum TV app did work as a reasonable substitute for my cable box, although I missed the DVR functions, and I was unimpressed with how it handled network congestion. If DVR functions, including pausing and resuming live streams, are important to you, you’ll likely want to stick with your cable box. I should note that Spectrum is actively engaged with improving the Spectrum TV app: for example, an update appeared within days of the app’s debut, and it seems likely that improved performance and even DVR capabilities may emerge in future updates. Two things make the Spectrum TV app a winner for me, even with the congestion glitches, clumsy network guide navigation, and incomplete Siri integration: its integration with the TV app, and the way it lets me use my HomePod pair as TV speakers. I suspect that Spectrum TV will cause me to use my Apple TV a lot more in days to come. New York State continues both its lawsuit against Time Warner Cable (now Charter/Spectrum) and its demand that Charter/Spectrum leave the state after revoking its approval of Charter’s merger with Time Warner Cable. The 60 day deadline for Charter to provide a transition plan, transferring Time Warner Cable services to another company, continues to slip as Charter and New York State discuss and litigate both situations. The article doesn’t say how much this app costs nor if there will be a monthly charge for it, does one need to keep the regular TV service from Spectrum or not. The app for Apple TV is a free download. As for the TV service, you need to talk with Spectrum to find out what they offer in your area. Where I live there is a package that offers internet service along with 125 channels of live TV streaming plus on-demand for about $90/month. So you don’t know if my current Spectrum TV service in NYC would still be needed or if some new service would be used in it’s place? I don’t really like the term “cutting the cable” but yeah that’s what I had intended to do-but this puts a new kink in that idea. As a NY State resident in an area that was Time Warner Cable before it was acquired a few years ago by Spectrum, I’ve been following the saga for a while. To get the state approval for the licenses, Spectrum agreed to extend coverage to remote rural areas that TWC was supposed to do but never did. Deadlines were part of the deal but were never met. So even NYC residents like me are riled up about it. And even though probably every other TWC resident is p.o. 'd about this. A majority of NYC residents are apartment dwellers, and few apartment buildings allow satellite dishes or Sling, etc. equipment (not enough room on roofs or window equipment blocks fire escapes). So for most people cable or FIOS are the only options, and Spectrum is the exclusive in my building. When the Apple TV deal was announced I was practically jumping up and down at the possibility of cutting the cord. But after checking what we’d have to pay for the stuff we want to watch, it will be more cost effective to keep the cable package. Some of the options on the cable package are not available on the Apple TV app. My guess is that it is something to do with retransmission rights between Spectrum and content providers. So for the moment, we’re SOL. When Time Warner Cable was acquired by Spectrum, I thought it couldn’t be worse. But it is. I’ve been a Charter customer for 20+ years; I have very, very few bad experiences with Charter, certainly fewer that the grumbling I hear from friends with Comcast and FIOS. In my building, you can have Verizon FIOS. But everyone in my building that switched as well as other friends and relatives that switched, all hated the service and went loony over being repeatedly hit with extra charges. Any outside antennas or dishes are forbidden. My husband likes some premium sports channels, and along with having to pay extra for stuff like HBO, it would not be cost effective for us to drop the cable TV/internet/ phone package we have. But if you can get the channels you want, it certainly does make sense to dump the TV package for the app. I think that it’s because taxes vary according to location. Some charges, like installation, also vary by area. And since there have been so many mergers/acquisitions among cable companies, including Spectrum, can vary.